Commercially planted in super-high-density orchards, the low-vigor Arbequina olive tree bears fruit earlier than traditional varieties. When planted in a wider spacing, this variety will exhibit a spreading, somewhat weeping canopy and grow to a medium size. Prized for its mild oil, the Arbequina olive is small and yields a very aromatic and fruity flavor that is low in bitterness. The Arbequina olive makes an excellent base oil for blending. The cold-hardy Arbequina tree is fairly disease-resistant and pest-tolerant, especially when planted at a lower density where airflow reduces foliar disease. Arbequina is self-fertile, but produces higher yields when planted with a pollenizer such as Koroneiki or Arbosana. The most popular table olive in California, Manzanillo is a large, round freestone with a high flesh-to-pit ratio. Although Manzanillo oil is good quality, it can be very difficult to extract if water content is high. For oil extraction, fruit should be harvested while relatively green. As the Spanish Manzanillo olive ripens, the flavor becomes fruitier and less bitter, but the water content increases making it better suited to curing than extracting. The Manzanillo tree is moderately vigorous with a spreading growth habit and medium density. Though partially self-fertile, yields will increase when Manzanillo is pollenized by Sevillano or Ascolano. This variety is moderately cold hardy, but offers less disease and pest-resistance than other olive varieties and should be treated with preventative applications of copper during cold months. 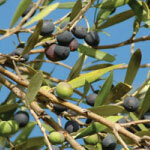 The Mission olive was used for oil production in the Spanish missions of Baja and Alta California in the late 1700's. The Mission olive is a large, erect tree used for table olives and oil production. This variety is tolerant of cold, salinity and drought. The Mission tree is susceptible to peacock spot, verticillium wilt and olive fly, but moderately resistant to olive knot. A consistent preventative program is recommended to manage disease and pests. The freestone Mission fruit produces a bitter flavor when harvested green, but matures to a complex blend of buttery and tropical flavors. Though partially self-fertile, Mission will set fuller crops when pollenized by another olive such as Sevillano or Ascolano. Also known as the Fruitless Olive Tree, among other names, the Wilson Olive is a patented tree discovered in 1979 in a Manzanillo olive grove. As its name suggests, it does not produce fruit, essentially removing any mess and possible allergy issues. As such, it is well suited to many commercial landscape applications. Grows to 25 ft. in both height and width when mature. Does well in lower elevations such as the desert, producing a sophisticated muted green silhouette. Full sun. Occasionally yields small cream to yellow tubular-shaped flowers in little clusters. It is drought tolerant, hardy to about the mid-teens. Further, it has no thorns and is pest free.